Performing the quality checks on the incoming and out-going deliverables as per the project requirements. Generating the coversheets for the documents and putting the decision stamps on the drawings as per the requirements of the projects. Creating the transmittals for all out-going documents and updating the Master Document Lists. Receiving the documents for all incoming documents and updating the master document lists and sending the acknowledgements. Providing the automated scheduled MIS Reports to Projects & Expediting teams. DC-Assist Technology embodies the developments in field of computing as Computer Vision, Artificial Intelligence, Digital Image Processing and Advance Decision Making Algorithms to enable RDCA to perform transactions on behalf of their masters - Human Document Controllers - subject to all checks as stipulated in the process are completed successfully. DC-Assist Technology can also be integrated with any document control software and also well also be used as a standalone application along with tBits CollabWrite. 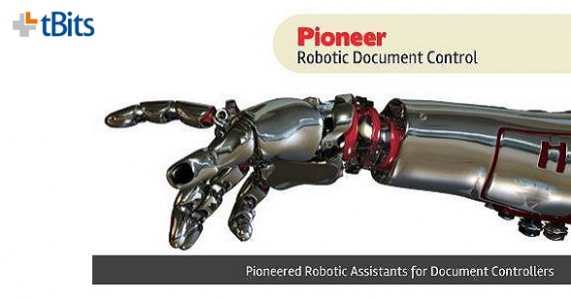 RoBOTic Document Control Assistant Technology can significantly automate the complete document control process and this pioneering document control software expert system can drastically reduce the overall workload of Human Document Controllers.